Last week, I went to The Church of St Paul the Apostle's website to look up their parish center hours and stumbled on a very interesting event - Broadway Goes to Church. 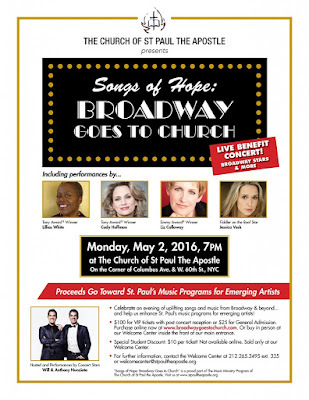 According to the EventBrite page, the mission of the Broadway Goes to Church concert series is to bring a group of Broadway stars into a Church to celebrate, empower and touch people through personal stories and the most inspiring music ever written from Broadway and beyond. The recent concert, which I unfortunately could not make, featured some heavy hitters including one of my favorites - Lillias White. An evening of inspirational music sounds (frankly) inspiring. A feature on the concert series was presented on NBC last year. See link here.